All locos available will be in use. 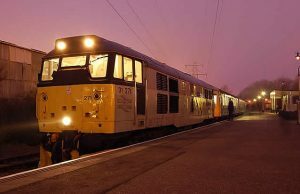 The star will be our two-season visitor 31271, supported by Class 47 1566 and hopefully a repaired D5310. This will be subject to the progress and success of traction motor repairs. Friday 28th should see 33271 cover the scheduled 3 trip timetable in place of the rostered DMU(subject to agreement with the LR Railcar Group). A DMU will also be in use for the weekend (hopefully the ever-popular and noisy Class 104. 08195 should also put in an appearance on a public working to give some rod action too. 5th & 6th. Traction: 1566. 11th: Traction: either 1566 or 31271, subject to arrival date & crew training. 1566 and 31271 should be available for driver experiences. D5310 may also be available for the September event. To book a driver experience place please contact the LR on 01978 860 979 or via info@llangollen-railway.co.uk. A popular event for the Railway featuring steam, diesel and classic buses. Traction should be 1566 on one day and 31271 on the other. The eighth Bus Rally and Classic Transport weekend should see one diesel locomotive in use each day on an interesting mixed timetable. The event is organised in conjunction with North West Museum of Road Transport, with a massive display of buses at Glyndyfrdwy station on both days of the event. 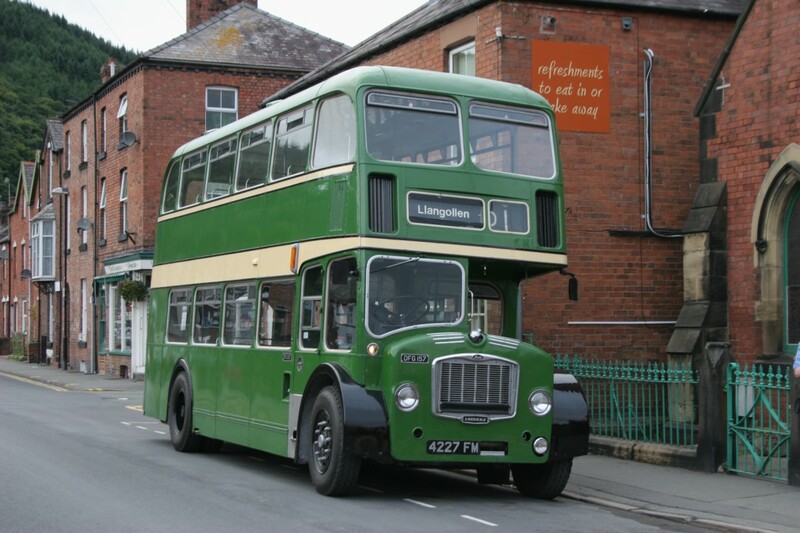 A FREE vintage bus service will be running between Glyndyfrdwy and Corwen regularly alongside the busy timetable of trains. For more information please contact Matt Davies matt@nwmort.co.uk. Traction should see 1566 on one day and 31271 on the other. 2010 saw this atmospherically themed, mixed-traction event debut with great success. Now in it’s 10th year, the 2019 1960’s weekend will feature an intensive timetable of steam, diesel and multiple unit operation. The railway will also host atmospheric sights and sounds from this halcyon era, including a vintage vehicle rally at Glyndyfrdwy and live music at Llangollen on Saturday evening. Visitors are encouraged to attend the event in period dress to help recreate a real 60’s atmosphere. Dr Beeching’s now legendary real ale bar will be open at Llangollen station with a range of excellent local ales along with lagers, wines, cider and soft drinks. 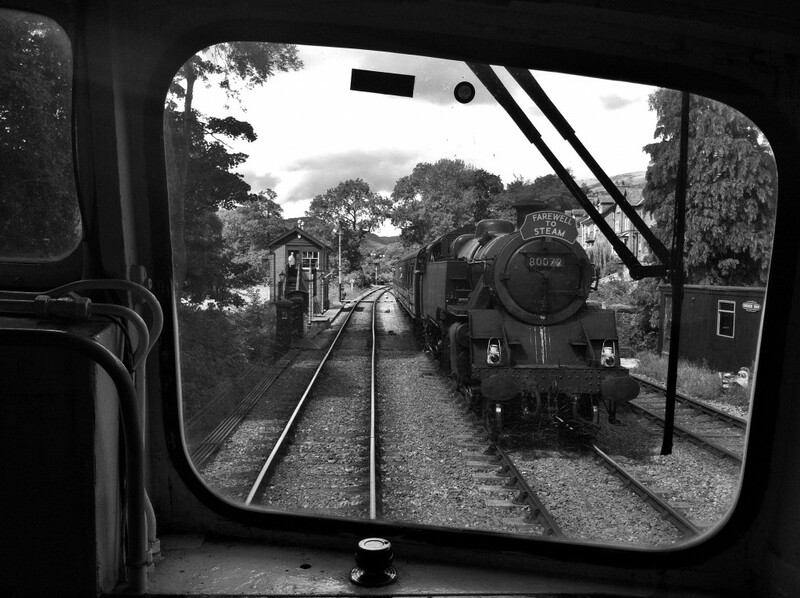 The below photo, taken from D5310’s cab at the 2014 event, shows what it’s all about – crossing 80072 at Goods Junction. All locomotives and events are strictly subject to availability.